I did a little searching on Betty Crocker's website and came across this recipe. It would make a great Valentine's Day breakfast or just an any time breakfast really. 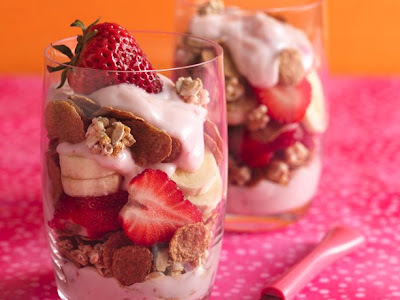 - In each of 4 (10-oz) plastic cups or parfait glasses, layer 2 tablespoons yogurt, 1/4 cup cereal, 1/4 cup strawberry slices and 1/4 of the banana slices. -Top each with 2 tablespoons yogurt, 1/4 cup cereal and remaining yogurt. Garnish top of each parfait with whole strawberry. -Make one big parfait and let everyone serve themselves. -Use your favorite fruits for the strawberries and banana.